the architect of one's own fortunes [of U.S. foreign policy] 自己の運命の開拓者[米国外交政策の立案者]. He was one of the principal architects of the revolution. 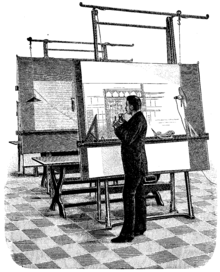 An architect at a drawing board. Middle French architecte, from Ancient Greek ἀρχιτέκτων (arkhitéktōn, “master builder”), from ἀρχι- (arkhi-, “chief”) + τέκτων (téktōn, “builder”). A professional who designs buildings or other structures, or who prepares plans and superintends construction. Plato made the causes of things to be matter, ideas, and an efficient architect. A person who plans, devises or contrives the achievement of a desired result. Peisistratus was the first architect of the Iliad and the Odyssey. French winger Hatem Ben Arfa has also taken plenty of plaudits recently and he was the architect of the opening goal with some superb trickery on the left touchline. (Philippines) A title given to architects. Usually capitalized or abbreviated as Arch./Ar. before the person's name. (transitive) To design, plan, or orchestrate. He architected the military coup against the government. Dacker was his own architect, (または, as he sometimes said, he architected his own fortunes,) and his own carpenter. It is interesting to record that the excavating and the laying of the pipes for the mains have been done by the Corporation employés under the supervision and control of Mr. Harpur, the borough engineer, who, by the way, architected the station.